Lombok is an island in West Nusa Tenggara (Nusa Tenggara Barat or NTB) province, Indonesia. It forms part of the chain of the Lesser Sunda Islands, with the Lombok Strait separating it from Bali to the west and the Alas Strait between it and Sumbawa to the east. It is roughly circular, with a "tail" (Sekotong Peninsula) to the southwest, about 70 km across and a total area of about 4,514 km² (1,825 sq mi). The provincial capital and largest city on the island is Mataram. It is somewhat similar in size and density with neighboring Bali and shares some cultural heritage, but is administratively part of NTB along with sparsely populated Sumbawa. It is surrounded by a number of smaller islands locally called Gili. Lombok is under the administration of the Governor of the province of West Nusa Tenggara (Nusa Tenggara Barat). The province is administered from the provincial capital of Mataram in West Lombok. 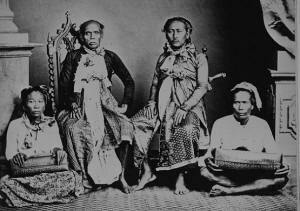 The indigenous Sasak chiefs of Lombok that allied with the Dutch to resist Balinese occupation. Little is known about the Lombok before the seventeenth century. Before this time it was made up of numerous competing and feuding petty states each of which were presided over by a Sasak 'prince'. This disunity was taken advantage of by the neighbouring Balinese who took control of western Lombok in the early seventeenth century. The Makassarese meanwhile invaded eastern Lombok from their colonies in neighbouring Sumbawa. The Dutch had first visited Lombok in 1674 and the Dutch East India Company concluded its first treaty with the Sasak Princess of Lombok. The Balinese had managed to take over the whole island by 1750, but Balinese infighting resulted in the island being split into four feuding Balinese kingdoms. In 1838, the Mataram kingdom brought its rivals under control. Relations between the Sasak and Balinese in western Lombok were largely harmonious and intermarriage was common. In the island's east, however, relations were less cordial and the Balinese maintained control from garrisoned forts. While Sasak village government remained in place, the village head became little more than a tax collector for the Balinese. Villagers became a kind of serf and Sasak aristocracy lost much of its power and land holdings. Dutch intervention in Lombok and Karangasem against the Balinese in 1894. During one of the many Sasak peasant rebellions against the Balinese, Sasak chiefs sent envoys to the Dutch in Bali and invited them to rule Lombok. In June 1894, the governor general of the Dutch East Indies, Van der Wijck, signed a treaty with Sasak rebels in eastern Lombok. He sent a large army to Lombok and the Balinese raja capitulated to Dutch demands. (see Dutch intervention in Lombok) The younger princes however overruled the raja and attacked and routed the Dutch. The Dutch counterattacked overrunning Mataram and the raja surrendered. The entire island was annexed to the Netherlands East Indies in 1895. The Dutch ruled over Lombok's 500,000 people with a force of no more than 250 by cultivating the support of the Balinese and Sasak aristocracy. The Dutch are remembered in Lombok as liberators from Balinese hegemony. During World War II a Japanese invasion force comprising elements of the 2nd Southern Expeditionary Fleet invaded and occupied the Lesser Sunda Islands, including the island of Lombok. They sailed from Soerabaja harbour at 09:00 hrs on 8 March 1942 and proceeded towards Lombok Island. On 9 May 1942 at 17:00 hrs the fleet sailed into port of Ampenan on Lombok Island. The Dutch defenders were soon defeated and the island occupied. Following the cessation of hostilities the Japanese forces occupying Indonesia were withdrawn and Lombok returned temporarily to Dutch control. Following the subsequent Indonesian independence from the Dutch, the Balinese and Sasak aristocracy continued to dominate Lombok. In 1958, the island was incorporated into the province of West Nusa Tenggara with Mataram becoming the provincial capital. Mass killings of communists occurred across the island following the abortive coup attempt in Jakarta and Central Java. During President Suharto's New Order administration, Lombok experienced a degree of stability and development but not to the extent of the boom and wealth in Java and Bali. Crop failures led to famine in 1966 and food shortages in 1973. The national government's transmigrasi program moved a lot of people out of Lombok. The 1980s saw external developers and speculators instigate a nascent tourism boom although local's share of earnings was limited. Indonesia's political and economic crises of the late 1990s hit Lombok hard. In January 2000, riots broke out across Mataram with Christians and ethnic Chinese the main victims, with alleged agents provocateur from outside Lombok. Tourism slumped, but in recent years has seen a renewed growth. The island's inhabitants are 85% Sasak whose origins are thought to have migrated from Java in the first millennium BC. Other residents include an estimated 10–15% Balinese, with the small remainder being Tionghoa-peranakan, Javanese, Sumbawanese and Arab Indonesians. The Sasak population are culturally and linguistically closely related to the Balinese, but unlike the Hindu Balinese, the majority are Muslim and the landscape is punctuated with mosques and minarets. Islamic traditions and holidays influence the Island's daily activities. In 2008 the Island of Lombok had 866,838 households and an average of 3.635 persons per household. The 2010 census recorded a population of 4,496,855 people in the province of NTB, of which 70.42% reside on Lombok, giving it a population of 3,166,789 at that date. Pura Meru in Mataram, a Hindu temple built in 1720. The island's indigenous Sasak people are predominantly Muslim however before the arrival of Islam Lombok experienced a long period of Hindu and Buddhist influence that reached the island through Java. A minority Balinese Hindu culture remains in Lombok. Islam may have first been brought to Lombok by traders arriving from Sumbawa in the 17th century who then established a following in eastern Lombok. Other accounts describe the first influences arriving in the first half of the sixteenth century. According to the palm leaf manuscript Babad Lombok which contains the history of Lombok describes how Sunan Prapen was sent by his father The Susuhunan Ratu of Giri on a military expedition to Lombok and Sumbawa in order to convert the population and propagate the new religion. However, the new religion took on a highly syncretistic character, frequently mixing animist and Hindu-Buddhist beliefs and practices with Islam. A more orthodox version of Islam increased in popularity in the early twentieth century. The Indonesian government agamaization programs (acquiring of a religion) in Lombok during 1967 and 1968 led to a period of some considerable confusion in religious allegiances and practices. These agamaization programs later led to the emergence of more conformity in religious practices in Lombok. The Hindu minority religion is still practised in Lombok alongside the majority Muslim religion. Indigenous Sasak dancers performing traditional Lombok wardance C1880. Hinduism is followed by ethnic Balinese and by a minority of the indigenous Sasak. All the main Hindu religious ceremonies are celebrated in Lombok and there are many villages throughout Lombok that have a Hindu majority population. According to local legends two of the oldest villages on the island, Bayan and Sembalun, were founded by a prince of Majapahit. According to the 2010 population census declared adherents of Hinduism numbered 101,000 people with the highest concentration in the Mataram Regency where they accounted for 14% of the population. The Ditjen Bimas Hindu (DBH)/ Hindu Religious Affairs Directorate's own analysis conducted in close association with Hindu communities throughout the country found that the number of Hindus in the population are much higher than counted in the government census. The survey carried out in 2012 found the Hindu population of Lombok to be 445,933. This figure is more in line with the commonly stated view that 10-15% of the Islands population is Hindu. The Nagarakertagama, the 14th century palm leaf poem that was found on Lombok, places the island as one of the vassals of the Majapahit empire. This manuscript contained detailed descriptions of the Majapahit Kingdom and also affirmed the importance of Hindu-Buddhism in the Majapahit empire by describing temple, palaces and several ceremonial observances. Christianity is practised by a small minority including some ethnic Chinese and immigrants from Bali and East Nusa Tenggara. There are Roman Catholic churches and parishes in Ampenan, Mataram, Praya and Tanjung. Two Buddhist temples can be visited in and around Tanjung where about 800 Buddhists live. The history of a small Arab community in Lombok has history dating back to early settlement by traders from Yemen. The community is still evident mainly in Ampenan, the old Port of Mataram. Due to the siting of a UNHCR refugee centre in Lombok some refugees from middle eastern countries have intermarried with Lombok people. A non-orthodox Islamic group found only on Lombok are the Wektu Telu ("Three times"), who pray three times daily, instead of the five times stipulated in the Quran. Waktu Telu beliefs are entwined with animism, and is influenced not only by Islam, but also Hinduism and pantheistic beliefs. There are also remnants of Boda who maintain Pagan Sasak beliefs and could be representative of an original Sasak culture, undiluted by later Islamic innovations. Tourism is an important source of income on Lombok. The most developed tourism area of the island is on the west coast of the island and is centered about the township of Senggigi. The immediate surrounds of the township contain the most developed tourism facilities. The west coast coastal tourism strip is spread along a 30 km strip following the coastal road north from Mataram and the old airport at Ampenan. The principal tourism area extends to Tanjung in the northwest at the foot of Mount Rinjani and includes the Sire and Medana Peninsulas and the highly popular Gili Islands lying immediately offshore. These three small islands are most commonly accessed by boat from Bangsal near Pemenang, Teluk Nare a little to the south, or from further south at Senggigi and Mangsit beach. Many hotels and resorts offer accommodations ranging from budget to luxurious. Recently direct fast boat services have been running from Bali making a direct connection to the Gili islands. Although rapidly changing in character, the Gili islands still provide both a lay-back backpacker's retreat and a high class resort destination. Other tourist destinations include Mount Rinjani, Gili Bidara, Gili Lawang, Narmada Park and Mayura Park and Kuta (distinctly different from Kuta, Bali). Sekotong, in southwest Lombok, is popular for its numerous and diverse scuba diving locations. The Kuta area is also famous for its beautiful, largely deserted, white sand beaches. The Small town is rapidly developing since the opening of the International airport in Praya. Increasing amounts of surfers from around the globe come here seeking out perfect surf and the slow and rustic feel Lombok. South Lombok surfing is considered some of the best in the world. Large polar lows push up through the Indian Ocean directing long range, high period swell from as far south as Heard Island from late March through to September or later. This conicides with the dry season and South-East trade winds that blow like clock work. Lombok is famous for its diversity of breaks, which includes world renowned Desert Point at Banko Banko in the southwest of the island. The northern west coast near Tanjung has many new upmarket hotel and villa developments centreed about the Sire and Medana peninsular nearby to the Gili islands and a new boating marina at Medana bay. These new developments complement the already existing 5 star resorts and a large golf course already established there.